Anyway, none of that matters now. 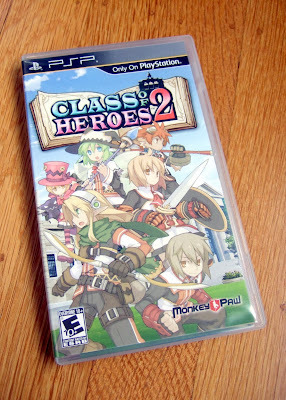 What matters is that my boxed copy of Class of Heroes 2 is in my hands. Since I'm guessing there are a lot of folks out there who are curious about the game but decided against picking up copies for themselves, I thought I'd fill today's post with some photos of mine. 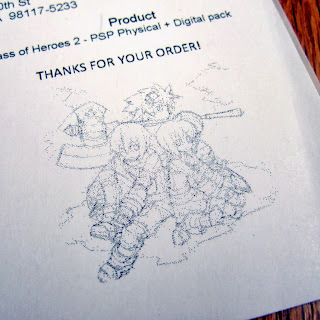 The photo above is of (part of) the packing slip that accompanied my copy of Class of Heroes 2. I think the illustration at the bottom of it was a nice touch, don't you? 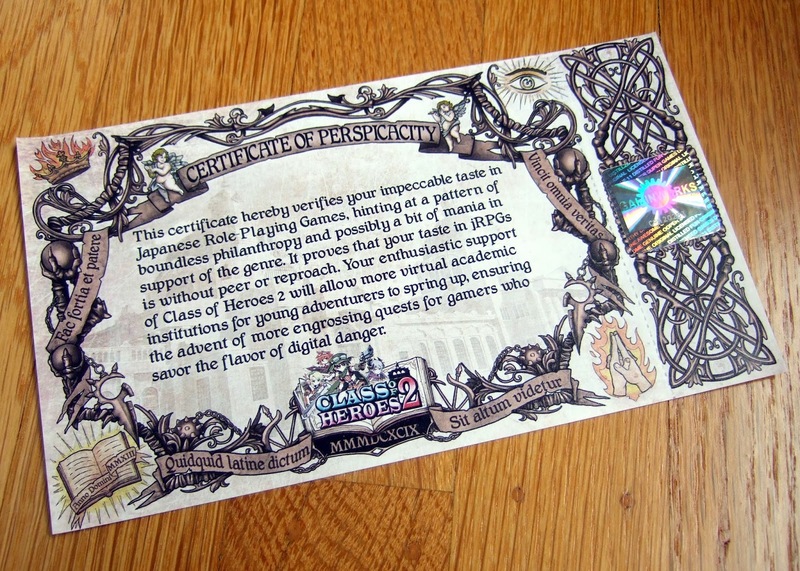 Each copy of the game also shipped with a "Certificate of Perspicacity," for whatever reason. 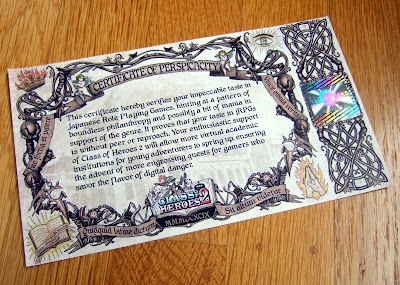 Also a nice touch, I think, although I'm not sure what I'm supposed to do with it other than hang on to it in case I ever decide to sell the game. 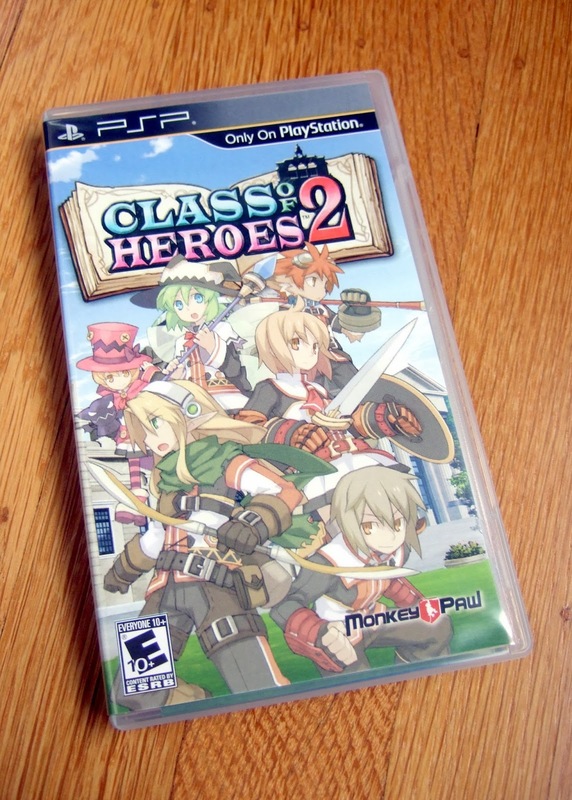 Here's a shot of Class of Heroes 2's case and cover art. It's a bit generic, I agree--in that it focuses on a grouping of the game's characters--but at least it's colorful. I'm not sure what's going on with the art that covers the case's backside, to tell you the truth. I know the game isn't sold at retail, so there's no need to include screenshots or text, but it seems kind of barren as is. Oh, well. 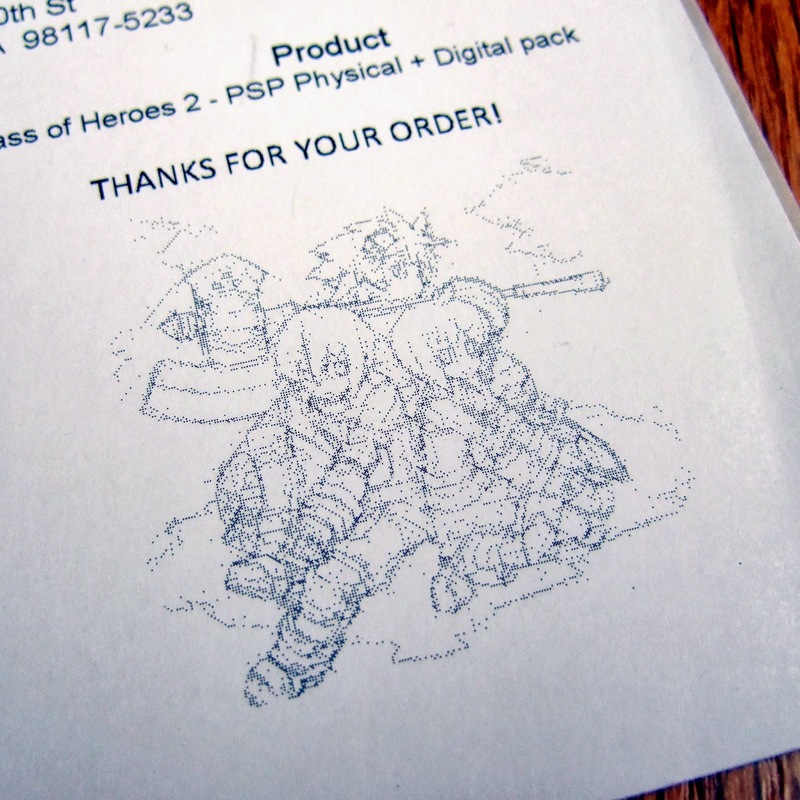 Surprisingly, these boxed copies of Class of Heroes 2 come with rather nice instruction manuals. 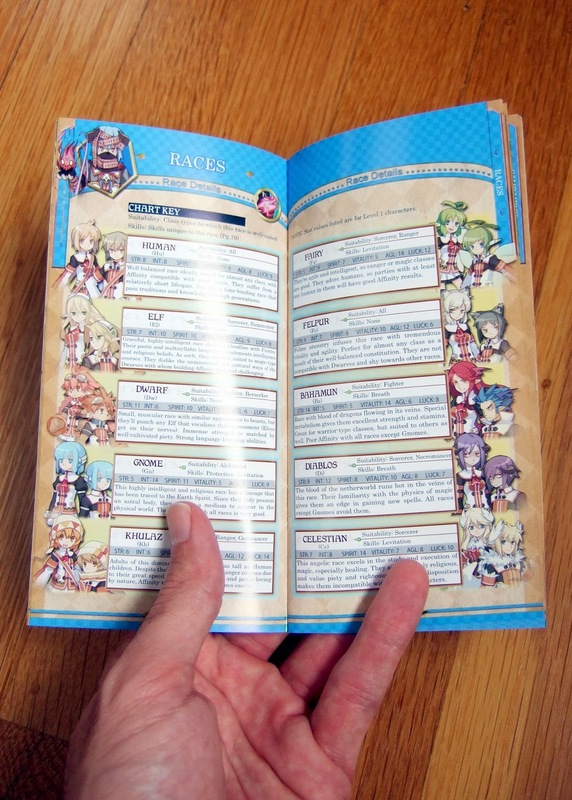 They're mostly filled with pertinent information, as opposed to punchy illustrations, but I'm OK with that. The UMD (above) that carries the game's code is pretty nice, too. 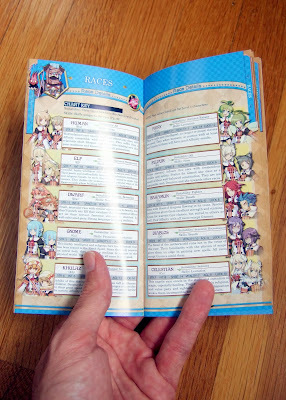 Sadly, I've yet to actually play Class of Heroes 2, so I can't tell you anything about the quality of Gaijinworks' localization or anything like that. I'll do my best to give it a go sometime soon-ish. Don't look for it to happen in the next few weeks, though, as they're sure to be devoted to Hometown Story, Pokémon X and a couple of other games. Awesome! I went digital with this one, but that looks like some sweet UMD goodness. The game is good too, though I haven't gotten all that far. Better than the first though already IMO. It looks so colorful and fun! 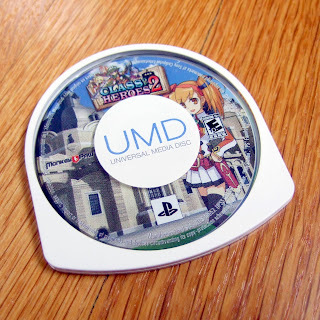 But I have a question about UMD that's more rhetorical than anything else: Universal Media Disc. Universal. Media Disc. Doesn't that mean that it should work in EVERYTHING? Universal. Seems like kind of a misnomer. I hear ya, Justin. Who knows what Sony was thinking when they came up with UMD. Maybe it's because they can hold games, movies or (I think) music? I don't know. Anyway, I'm actually a big fan of them, although I can see why Sony decided to go with tiny carts (a la DS/3DS) for the Vita. I'm curious, has anybody translated the Latin on the certificate? Wow, finally! I've been interested in seeing how the physical version would turn out for a while now. I agree about the back cover... how strange! Perhaps they want to draw attention to the fact that it's a special printing not available in stores? Regardless, glad you finally got your hands on your copy :) Did you ever start playing the digital version? If I missed a post about it, sorry for asking, but I'm curious what you think! I thought it was going to be delayed for quite a while longer, so I really shouldn't complain about having to wait 6 months, should I? 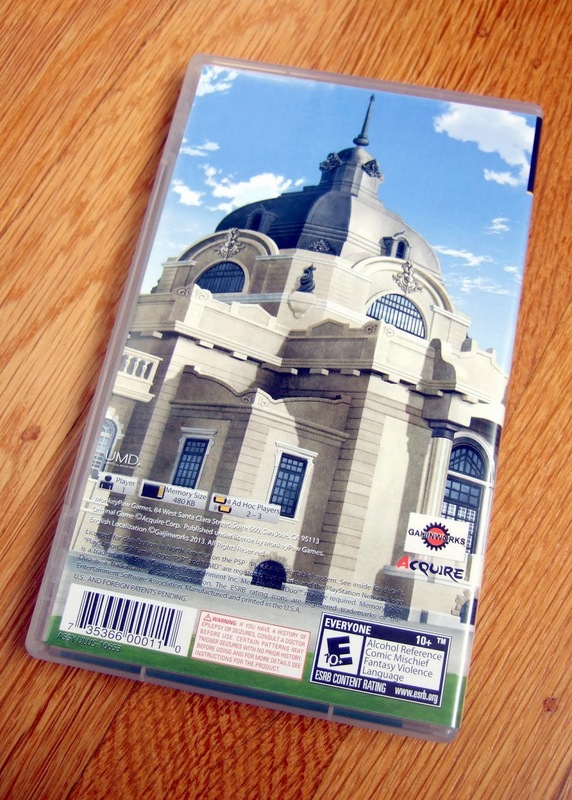 Anyway, yes, the back cover is kind of odd--especially since that piece of art isn't even all that appealing, IMO. Like I said in the post: oh, well. As for the game: nope, I haven't even started the digital version. I'm a bad gamer, I know. I'm going to try to play a bit of it soon, though, as I feel like I should share some impressions sooner rather than later if I expect anyone to care. Well, there were a few things with the first game that were either lazy or annoying. The dungeons had half of each maze mirrored to create the full layout. The mazes in this one are all hand made (I guess is one way to put it). They streamlined a few other things with the academy too. The gameplay is largely the same.. but the little updates here and there make it the definitive one of the two to get. Oh, that's good to hear--about CoH2, I mean. Have you played any of the other CoH games, BTW? Sounds like we may wind up with more of them via Gaijinworks, which is kind of amazing, IMO. Would you mind posting a hi-res scan of the cover art? I know there are cover shots out but I couldn't find any with the new ESRB rating :-). Who's up for some more Hakuoki?